Bottom Line: The best way to feel more energized? Stay active! Top research journals have shown that moderate exercise can increase your energy. A simple 10-15 minute walk can get your blood pumping and increase the oxygen coming into your body, helping you feel more energized and maybe even helping you shed a few extra pounds. Why it Matters: Moderate exercise can help you feel energized by releasing endorphins, which make you feel happier, while contributing to a better quality of sleep. Additionally, exercise helps train the heart to work more efficiently. Ultimately, your immune system will also function better with consistent exercise. In other words, exercise can not only help you feel more energized, but it can reduce your likelihood of getting sick. And combining a moderate exercise routine with chiropractic care may be one of the best ways to stay healthy and energized all year long. Next Steps: Start with a simple calendar. Schedule at least three days per week that you can take a 10-15 minute walk. By putting the activity on your schedule, it’s more likely that you will follow through. Also, ask us about how chiropractic care may be able to keep you pain-free and on track with your exercise goals. We want to partner with you to make this year your healthiest and happiest year ever! Abnormal cells, a precursor to cancer, grow in our bodies at all times. Many things lead to creating multi-nuclei cells (cancer), such as chemicals and radiation. 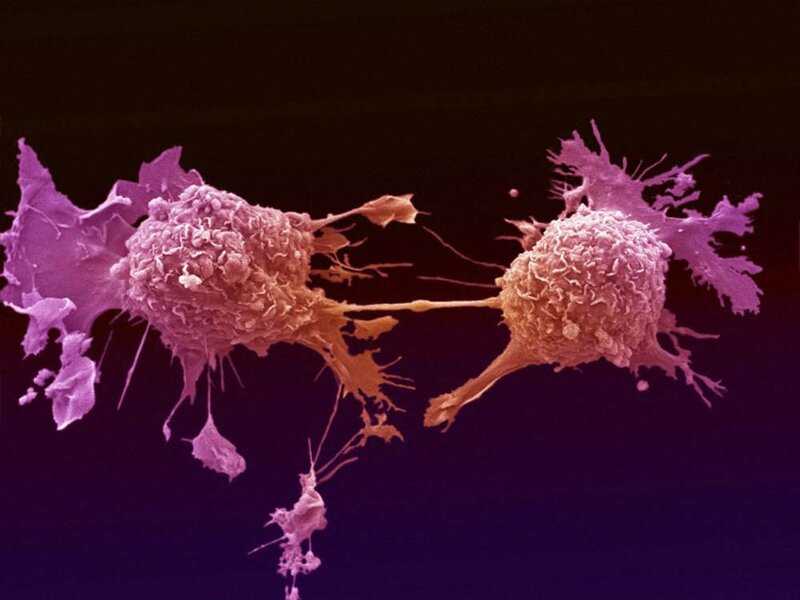 Once these cells mutate, it’s the duty of the innate intelligence inside our body to detect the cancer cells and use its defense mechanisms to eliminate the cancer cells via the immune system. Our immune system is a learned innate intelligence response to foreign antigens, aka germs. The immune system starts working via a mothers breast milk, giving her baby the needed antibodies to fight off diseases while the newborn’s immune system begins to grow. As the baby transitions from breast milk to regular foods, the newborn’s immune system takes on a bigger role of fighting off the bacteria and viruses that assault our bodies on a constant basis. Many of the childhood diseases are considered building blocks for the immune system and provide long term immunity in most cases, such as chicken pox. The immune system studies the virus and/or bacteria and starts a library on the foreign invaders, so it will know how to react to them the next time. Part of the immune response includes a fever, extra mucus, coughing, and sneezing (symptoms), all of which are programmed responses to help the body fight off and expel the foreign invaders. As a baby weens off of breast milk, the immune system should be strong enough to handle the normal flora (bacteria present in your environment) and fight them off with minor sickness (having symptoms). Your immune system is like a baby as it grows. It will use all of its senses to discover how a germ lives in order to recognize them and use its tools to seek them out and destroy them. According to a new study involving pacifiers in Denmark (1), when a health baby is allowed to be involved with germs, greater immune responses evolve. When a baby is subjected to a sterile environment, the immune system starts to act inappropriately. When you reach for the disinfectant and antibiotics for normal childhood symptoms, are you helping the immune system grow or are you robbing it of an opportunity to grow and become stronger? If childhood diseases are building blocks for the immune system and they help us create a thriving foundation for our children’s immune system, should we rethink how we use products that keep us at arms length from the childhood germs? Growing up in a chiropractic family, we weren’t immune to getting sick, but we empowered our bodies with the proper sleep, nutrition, hydration, and a nervous system free of interference, to allow the body to adapt and overcome the foreign antigens. By using the milder diseases as building blocks, our body’s innate intelligence has a greater ability to adapt and survive to it’s environment. Our family is rather healthy and free of most ailments that our environment is inflicting on many children today, such as diabetes, autism, allergies, asthma, reflux, migraines, autoimmune diseases, etc. Back to the immune system. Every day your body is fighting cancer cells by releasing white blood cells that specialize in finding and exterminating irregular cells. Our immune system should be treated like our body. Do we like a weak, flabby, couch potato figure? How does someone achieve a flabby body? The flabby body usually didn’t require much work or a plan, it just happens from the mindset “whatever is easiest“. Or do we gravitate to a lean, muscular, strong body? How did the muscular/strong frame come to be? To get a lean, muscular, strong body, it took a plan that included a lot of work, proper sleep, good nutrition, lots of hydration, and a nervous system with less interference. Which type of immune system do you want, a couch potato one or a sleek, mean, green, immune machine? When you look in the mirror tomorrow, do you see a body and immune system that looks up to the task of the day of fighting cancer cells? Or have you let yourself go a little? Much of the USA population doesn’t have a choice when it come to fighting cancer; the first layer of the foundation was allowing a baby to come in contact with simple germs while under the protection of mom’s breast milk, but most children have seen a sterile environment and formula for nutrition. Only the outliers get the benefit from dropping their pacifier on the floor and putting it back in their mouth. The second layer of the foundation was the the childhood diseases, but most children are vaccinated to the point that only the outliers get the benefit from having the chicken pox as a building block. The third layer of the foundation was the common bacterial infection, but most children are given antibiotics for the smallest fever, sniffle, or earache, so only the outliers get the benefit from fevers, common bacteria, and simple upper respiratory infections. In today’s society, how could we think that our bodies could fight off cancer cells when we’re destroying all of the learning experiences for immune system? Next time you want to sterilize something, inhibit a natural function, or pop an antibiotic in your mouth, stop and ask the question “Am I really helping myself in the long term or am I sacrificing long term health for short term relief?“.